The new Assembly District 11. Map and information by Meridian Pacific, Inc. The California Citizens Redistricting Commission took their first vote on the final maps for State Assembly, State Senate, Congressional and Board of Equalization district maps, yesterday, Friday, July 29 and the results mean many changes for Antioch. 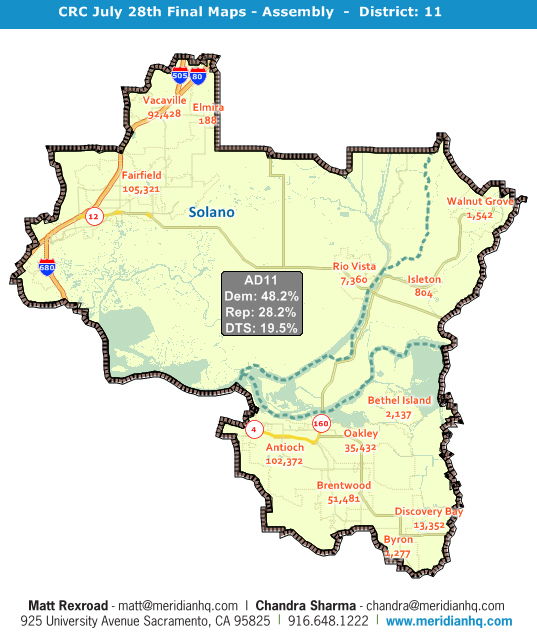 All of Antioch will now be in a new Assembly district, labeled AD11, with the other East County communities of Oakley, Brentwood, Discovery Bay, Bethel Island, Byron, Knightsen and part of Pittsburg, as well as the majority of Solano County. The city will no longer be represented by Susan Bonilla (D-Concord) and will get a new Assembly member, since there is no incumbent who currently lives in the new district. A member of either the Assembly or State Senate must live in the district they represent. The new Congressional District 9. Map and information by Meridian Pacific, Inc.
Antioch will also be getting two new members in the House of Representatives, with the western side of the city moving into Congressman George Miller’s (D-Martinez) district and the rest of the city into a district with no incumbent. However, Congressman Jerry McNerney (D-Pleasanton), who currently represents a portion of San Joaquin County and Eastern Contra Costa County, announced he will be moving into the new district in San Joaquin County, although that’s not a requirement for Congress. The new congressional district maps divide Antioch in a peculiar way, because each congressional district has to be equal in population, unlike State Assembly and Senate Districts, which have an approximate one percent population deviation from one to the other. The new district line runs from Somersville Road, south of the James Donlon Blvd. intersection, down the middle of James Donlon Blvd., includes the Twin Creeks Apartments and then turns north down the middle of Contra Loma Blvd. Then the line runs along Putnam Street, then turns north along D Street to San Joaquin Avenue. It turns east to West Tregallas Road, follows that road around the Post Office back to D Street, then heads north to the west bound lanes of Highway 4. 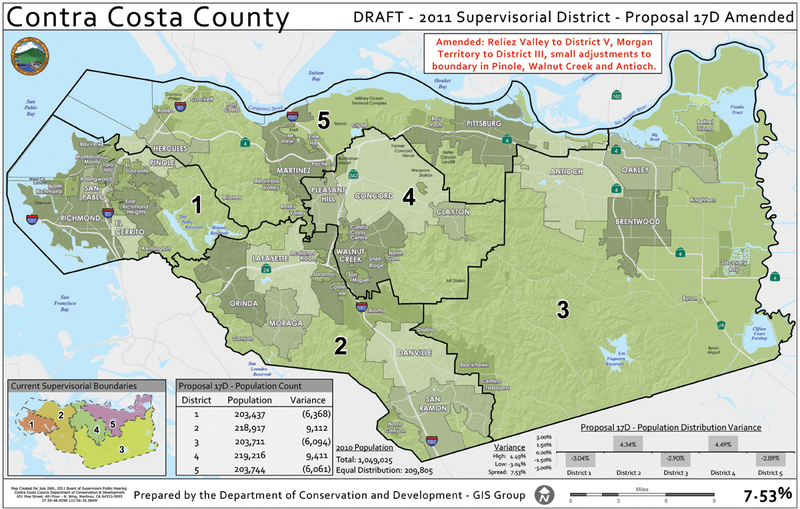 The new Congressional District 11, including western Antioch. Map and information by Meridian Pacific, Inc. It then runs east to A Street, turns north and runs in the middle of A Street to 18th Street. The dividing line then turns west and runs along 18th Street to D Street, again, turns north to 10th Street. It then makes a right turn and heads one block east along 10th Street to C Street, then south on C Street to Park Lane. It then runs east on Park Lane back to A Street where it turns north and runs up to Beede Way, turning east, briefly to Almond Court, to Wilbur Avenue. It then turns east and runs down the middle of Wilbur Avenue to Fulton Shipyard Road. It turns north and runs along Fulton Shipyard Road to just east of the old shipyard and runs north out into the river. 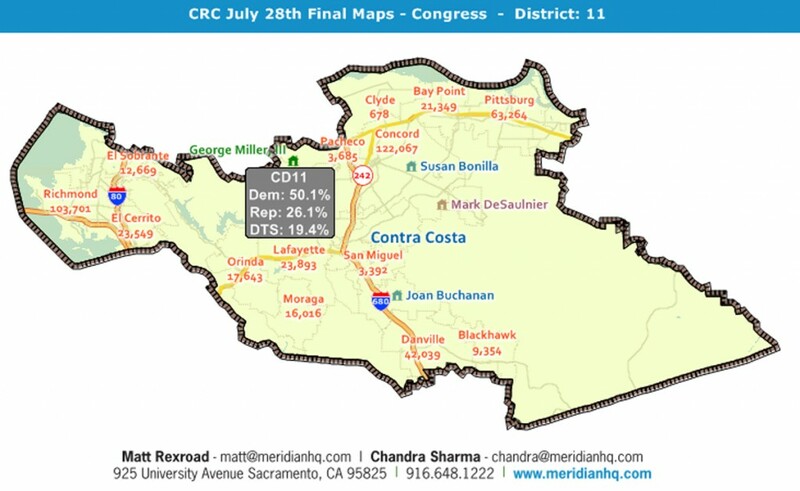 In general, if you live on the northwest side of the dividing line, you’re in CD11 with the smaller portion of Antioch, all of Pittsburg, Bay Point, and most of the rest of Contra Costa County, and Eastern Alameda County. If you live on the southeast side of the line, you’re in CD9 with most of Antioch, Far East County and northern San Joaquin County. The new State Senate District 7. 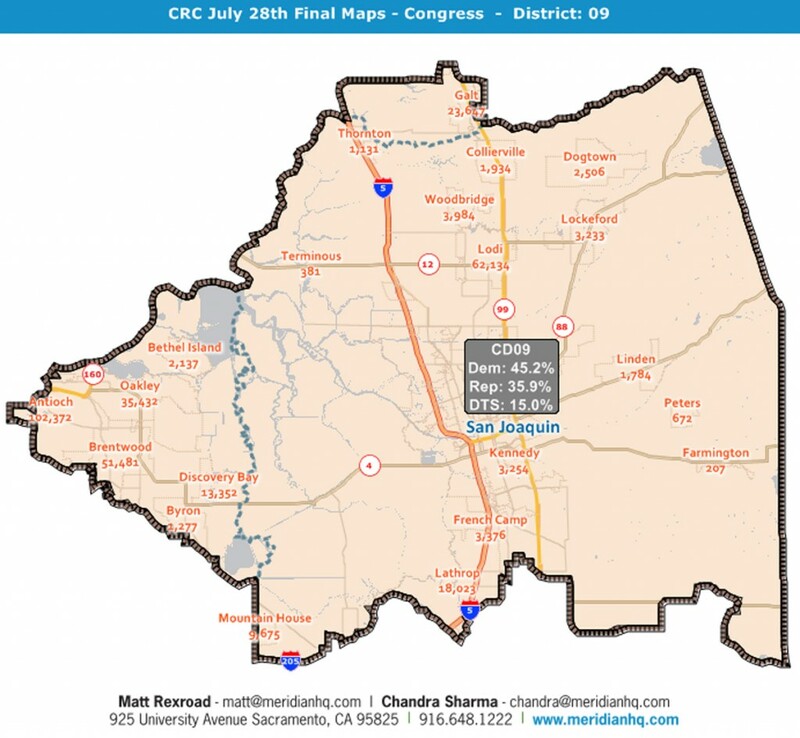 Map and information by Meridian Pacific, Inc.
State Senator Mark DeSaulnier (D-Concord) will continue to represent Antioch and the rest of East County, as well as most of Contra Costa County, plus Dublin, Pleasanton, Livermore and Sunol in Eastern Alameda County, in State Senate District 9. Finishing his first term in the State Senate, he is up for election, next year and can run for only one more term. For more information and to see all the maps of all the 177 new districts throughout the state, click here or visit either www.wedrawthelines.com or Meridian Pacific’s website at www.mpimaps.com/mapanalysis. Bobby D Duncan in front of his restaurant. 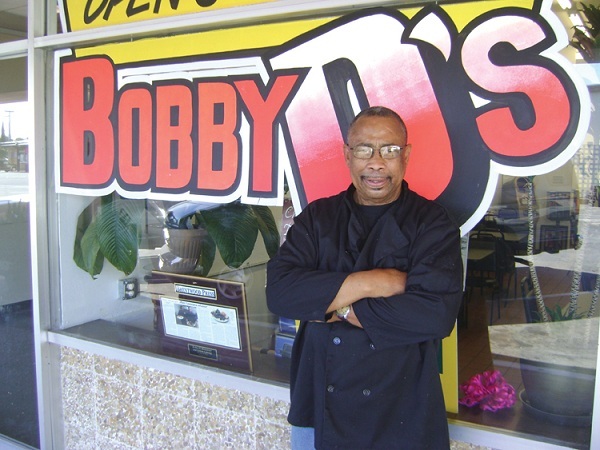 Out of Louisiana bringing barbeque Creole and Cajun comes Robert Duncan — chef and owner of Bobby D’s, a carnivorous cornucopia, a get it catered, take it out or eat it there, down home endeavor. He learned cooking from his 102-year-old grandmother. Grandma taught him right. Good ingredients go in and everything comes out right. The crab cakes come covered with a crispy crust. The fork releases the savory flavor of the tasty bits of crab as it is in heaven. The blackened catfish evokes visceral thrills. At one of the simple serviceable tables a skinny kid gets on the outside of five of the seven pork ribs. “Meaty and firm, but easy to chew” is his verdict. Get the barbeque sauce on the meat or on the side. Nice touch. The place smells like meat. It arrives in big plastic platters. $8 to $16. You get jalapeno or regular corn bread or bread. Choose two sides from many. No corporation-dispatched, standard-themed cutesy venue here — we’re talking local owned and operated. But the best reason is the food served in this well-fluorescent-lighted clean place with the kitchen open to the dining room. Get wings, or get it fried, barbequed or grilled or blackened in a salad. Tuesdays Felicia McDaniel and nephew Jamari take out takeout chicken after teaching Zumba at Delta Park. Half chicken for him, quarter for her. And on and on as the attentive, not gushy waitress brings it on. The windows face Louisiana. Eating is the aesthetic. Check this: no checks and no pay by swipe or blink, but an AnyTimeMoney machine lets you slot your card because it’s cash only. The sugar bowls are the traditional fluted heavy glass with a metal top. Drink from a hefty plastic glass with Coke writ on the side. Get a dessert; pack it if you can’t handle it. Bobby D’s is at 1635 A Street in Antioch. Call them at 925-775-4025. Or better yet, just drop by. It’s open late morning to late evening. SSGT. Daniel Fye, is an EOD Tech in the Air Force. He was wounded in action about a month ago. Daniel has undergone 7 surgeries to date. Daniel is a graduate of Pittsburg High and grew up in Pittsburg and Antioch. His family still resides in Antioch. I met his mom Janis through our Blue star families group; she has been involved since 2005. WE NEED TO DO WHATEVER WE CAN TO HELP THIS FAMILY, not out of pity or sympathy, rather that we OWE IT TO THEM. Daniel has a wife and 4 children. Please contact me to volunteer, donate or help get the word out. The benefit is on Saturday, August 20th from 4 p.m. to 10 p.m. in the Winners Circle Western Wear parking lot, 10th and A streets in Antioch. $20 a plate per person for a choice of either BBQ of hamburgers, hot dogs, or chicken plus salads and one drink. 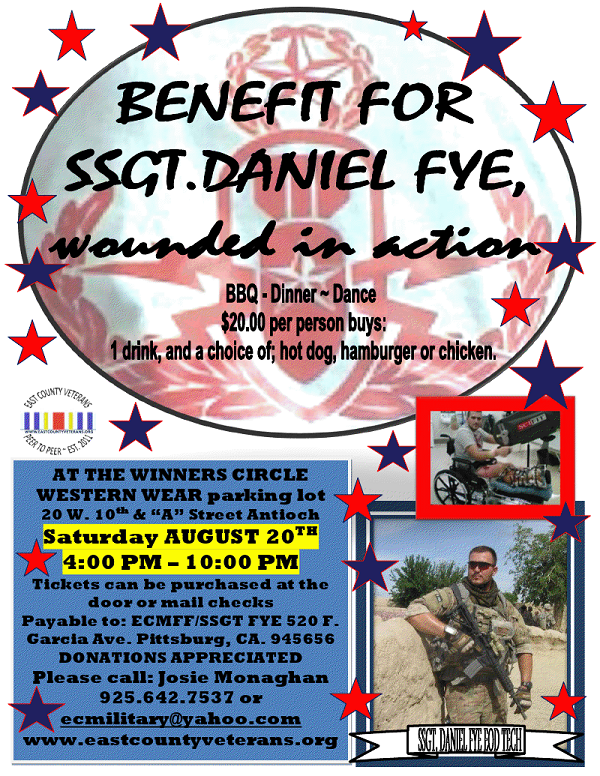 Please mail checks to ECMFF/SSGT FYE 520 F. Garcia Ave. Pittsburg, CA 94565. We will have your tickets at the door and you will receive your wrist band. RAFFLE BASKETS – 50/50 – LIVE MUSIC – DANCING – This is an outdoor event compliments of Fred & Sue Pederson, owners of the Winners Circle Western Wear Store. Josie 925.642.7537, ecmilitary@yahoo.com www.eastcountyveterans.org. The Antioch Police Department is excited to announce the 26th installment of the Neighborhood Cleanup Program. This is a collaborative community effort which involves active participation from United Citizens for Better Neighborhoods, community volunteers, the Antioch Police Department Crime Prevention Commission, Neighborhood Watch Program and the Public Works Department. Collectively, “We”, everyone who works and lives in the City Antioch, can make a difference and improve the quality of life. It’s our community and it’s our chance to make a difference. The City of Antioch Neighborhood Cleanup program is not just for residential neighborhoods. It is a program that will change venues on a monthly basis and it will include business and commercial areas as well. Neighborhoods that are free of trash and refuse are inviting, and a clean community instills a sense of community pride. The 26th Neighborhood Cleanup event will occur on Saturday, August 6th from 9 a.m. to 11 a.m. Volunteers should report to Knoll Park located at 5000 Country Hills Drive. Volunteers will receive instructions and the equipment necessary to accomplish the goal. The targeted area is within walking distance. Excluding inclement weather, future Neighborhood Cleanup events are scheduled for the first Saturday of every month and the locations will be announced in advance. Remember, cleaning up your neighborhood can make life better for your family, your neighbors and your community! All lanes on westbound Highway 4 at Loveridge Road will be closed for several hours on Monday, August 1 between 10 p.m. and 3:30 a.m. This work is to ensure public and crew safety while crews work to place steel piles for the bridge structure at Loveridge Road. The detour for this work will be as follows: motorists will be directed off the highway at Somersville Road/Auto Center Drive, left on Somersville Road, continue on to Auto Center Drive, left on Tenth Street, left on Loveridge Road, right on California Avenue, and left on westbound Highway 4. Motorists are advised to expect delays and allow extra time for their commute. Please drive with caution through the detour and leave a safe traveling distance between your vehicle and the vehicle ahead of you. Caltrans and CCTA appreciate your patience as they work to improve the highways. Antioch’s first full-service health club, Delta Park Athletic Club, will become a Gold’s Gym, starting September 1st. Current members will be grandfathered in at their current rates, it was shared. Neither current owners Ed and Cindy Wilkerson, nor Gold’s spokesman Dave Reiseman were available by phone or email, today. Antioch resident Molly Gravelle, a long time employee of Delta Park, shared her thoughts. Most of Antioch will have a new County Supervisor starting in September, while the northern part of the city will continue to be represented by Supervisor Federal Glover in District 5. On Tuesday, July 26, the Contra Costa Board of Supervisors on a 3-2 vote, approved a final redistricting plan for their five districts which splits Antioch along Highway 4 and East 18th Street, with most of the city in an East County district with Oakley, Brentwood, Discovery Bay, Bethel Island, Byron and Knightsen. The larger part of Antioch south of Highway 4 and East 18th Street will move into District 3, currently represented by Supervisor Mary Nejedly Piepho of Discovery Bay, as of September 8, which is 30 days after the August 9 scheduled final vote on the new plan. Supervisors John Gioia, Karen Mitchoff and Glover voted for the new plan, while Supervisors Gayle Uilkema and Piepho voted against it. The latter two preferred a plan that did the least to change the current district configuration. 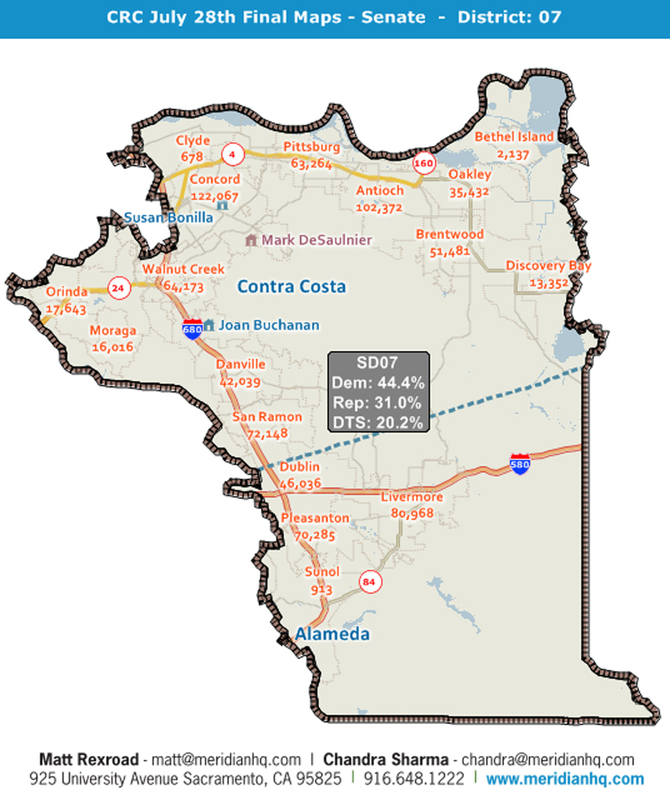 The new map was a variation of the plan proposed and submitted by the Contra Costa Citizens Redistricting Task Force (of which I was the Chairman), which was labeled Concept 6 and garnered the most support during the public process, including 14 workshops throughout the county, emails, postcards and letters. However, in that plan only Concord – the county’s largest city – was split and it had the smallest population difference from one district to the next at 3.56%. That was opposed by Mitchoff of Pleasant Hill who currently represents Concord and made keeping that city whole one of the key requirements for her vote. So, in order to obtain her support, Gioia made changes to Concept 6 and it was relabeled Proposal 17, splitting Antioch, Pinole, Walnut Creek and Concord by 10,000 to 11,000 residents each and presented it at the July 12 Board meeting. But, Mitchoff still opposed that. So Glover, who was prepared for such a possibility, presented Proposal 17D at the same meeting, which made Concord whole, but split Antioch further and the San Ramon Valley, moving Diablo, Blackhawk and Camino Tassajara into the East County district. Further changes were made to that plan to bring it under an 8% population deviation between districts and labeled Proposal 17D Amended, and presented at the July 26 meeting. Uilkema, who is up for reelection next year and will now have half her district new, with the San Ramon Valley in and Hercules, Rodeo, Crockett and Martinez out of the district, argued for making the least amount of change. Gioia, the main member pushing for what Uilkema labeled “radical change”, spoke of the current districts in support of the new plan. Before the vote, things got heated between Mitchoff and Piepho. Piepho who lost part of Walnut Creek and the entire San Ramon Valley from her district, gave an empassioned speech in favor of her Proposal 15, which kept whole all the cities and communities in the county, and had the lowest population deviation of the final five plans under consideration by the Board, that day. “How can you split Antioch, Pinole, Walnut Creek and the San Ramon Valley and meet your definition of keeping the commonalities of communities (quoting Gioia’s earlier comments)?” she asked of her fellow Board members. One last effort by the task force was made at that meeting, by presenting a plan labeled 17E, which revised Proposal 17, making Antioch and Pinole whole, keeping Walnut Creek split by leaving only Rossmoor in District 2 and splitting Concord by about 5,000 less than in Concept 6. A variety of individuals spoke in favor of the proposed plan, including Antioch Councilwoman Mary Rocha and East County Democrats for Action President George Van Hasselt. Rocha also argued from the standpoint of which plan had the highest percentage of Latinos in each district. Both Proposal 17D Amended and 17E have three districts that are close to or more than 30% Hispanic. But, none of the Supervisors would bring up17E for consideration and in the end it was Proposal 17D Amended which was adopted. Glover gave up Oakley, Bethel Island and most of Antioch, and picked up Clyde, Martinez, Pacheco, Port Costa, Crockett, Rodeo, Hercules and part of Pinole in his new district. Piepho offered her thoughts following the meeting. Both Glover’s and Piepho’s terms end and they will be up for election, next year. For more information on the new map, with detailed population and demographic information, vi sit www.ccredistricting.org and click on Maps and Data. National Night Out (NNO), scheduled for Tuesday, August 2 from 6 p.m. to 9 p.m., is an annual nationwide event designed to strengthen neighborhood spirit and unity, raise crime prevention awareness, and develop partnerships between the City and the community on a street, block and city-wide level. This unique safety and community event is sponsored by the National Association of Town Watch (NATW). Residents do not need to be involved in any type of Neighborhood Watch to participate in NNO; however, NNO provides the perfect incentive to begin a program on your block. This year representatives from the City of Antioch, Antioch Police Department, Crime Prevention Commission and Neighborhood Watch Program will be visiting (23) block parties throughout the City. The block parties and barbecues are a great way for people to meet one another, have fun, promote police-community partnerships, and explore how they might work together to improve the safety and the quality of their neighborhoods. If you are interested in starting a Neighborhood Watch Program in your neighborhood, please call (925) 779-6980 or email neighborhoodwatch@ci.antioch.ca.us.